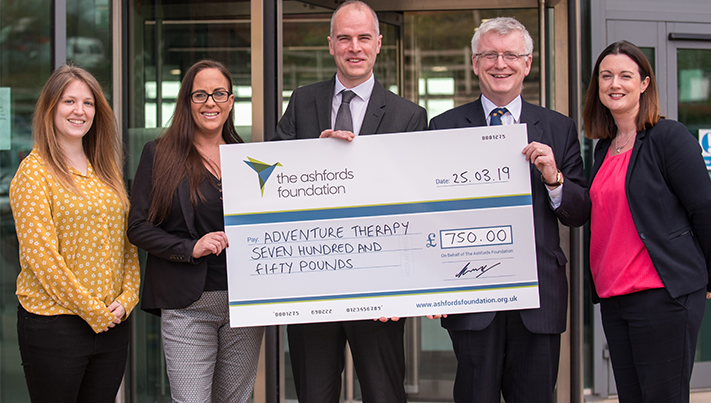 Law firm Ashfords LLPs’ newly established charitable foundation, The Ashfords Foundation, has awarded its first grant in Devon to the charity Adventure Therapy. The charity was established in 2017 to improve the emotional well-being of children and adults with unique health conditions, impairments or limitations through outdoor activities and adventure-led pursuits; from coasteering, surfing and kayaking through to climbing, horse riding and archery. Activities are provided free of charge and the charity is funded entirely by charitable donations and the support of the communities it serves. The grant of £750 will fund improvements to Adventure Therapy’s IT equipment and also assist with marketing and communicating the charity’s services to the individuals, families and organisations who may benefit from Adventure Therapy in Devon.